A lesson on eating well on a budget and saving energy around the home has recently provided food for thought at Pencoys Primary School in Four Lanes. 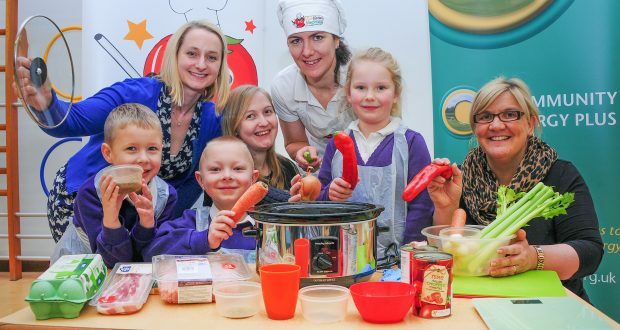 24 families and their children enjoyed a slow cooking workshop designed to encourage families to cook and save energy together. The workshop was part of a pioneering project being led by the Truro-based energy charity Community Energy Plus. Last year the charity received national recognition in the Energy Impact Awards for the achievements of their ‘Energy Fit Kitchens’ project which delivered a series of workshops introducing slow cooking skills. At the same time participants were given practical advice on saving energy and money in the home. 611 families were supported by the pilot project last year. The Energy Impact Award has provided funding to help develop the slow cooking project further. Five workshops are taking place at schools around the county to work with a further 75 families this winter. During the workshops, parents and children are learning practical lessons about preparing and cooking fresh food to help them eat healthily on a budget and reduce their energy bills. To deliver the project, Community Energy Plus has joined forces with the Cornish social enterprise Little Kitchen Magicians. Using fresh ingredients and slow cookers provided free of charge by the project, families have been learning about the multiple benefits of using the slow and low cooking method to use relatively inexpensive ingredients to produce tasty and healthy family meals. The Energy Impact Awards, run by leading fuel poverty charity National Energy Action (NEA) in partnership with British Gas, recognise best practice that focuses on energy projects tackling fuel poverty by benefiting vulnerable people.